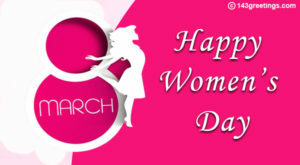 Women’s day is celebrated on 8th of March every year. This day of celebration came into existence when an activist of America first organized an event on 28th of February, 1909 in New York speaking about rights and freedom of women internationally. The day was adopted to celebrate womanhood in 1975. Now, 8th of March is no more an alien date for people. Everyone is well aware of its worthwhile. But alas! Most women around us, do not take this day as special as they should. For some, it is just like a regular day, for some, it is the day to talk about women empowerment, a day to raise a voice against injustice they have been facing etc. This is all good, however, the true meaning of women’s day is something different and every woman should perceive it correctly. When the world is celebrating, woman day on 8th March, it is the responsibility of a woman to become the part of celebration and enjoy liberty. What Is The Intent Of Women’s Day? The people who were behind making 8th march as women’s day, has a wide vision pertaining to this. Their intent was not to assign a date for women in the world, on which they can stand and fight for their rights, but the objective was to showcase the importance of women in society, to make every woman realize that they have a strong footprint in society and its development. And at the same time, to express gratitude, love and respect that society has for women. A woman can’t celebrate their very own day, until their counterpart from their heart give them the right to be the part of this celebration. It is the responsibility of men to let women in their surroundings, enjoy their life the way they want. The women should realize the importance of freedom, being empowered, knowing their rights. On Women’s Day, this is the accountability of every woman to check what their constitutional and moral rights. They should take a pledge to practice the same. On Women’s Day, different organizations conduct workshops and seminars to educate woman about their rights. There is no perfect way of celebrating Women’s Day then getting educated about rules, regulations and rights that the constitution of a country gives to their women citizens. On the day of Women’s Day, move ahead, and in addition to learning the rules and rights set for women in the country, also educate those who don’t have access to this information. If you are able to lift the life standard of even a single woman, it means you have celebrated the women’s day in a true sense. For promoting gender diversity, it does not mean one should be working or amid a group of people. Initiatives could be taken at home as well and one should promote this thought from their family and friends. Fostering gender equality is a long term process and it should be in one’s attitude. But, celebrating IWD is also important. Collect a few successful women in your society and hold an event to celebrate the day. Many will get inspiration from this event and some life’s will also. Amid all this, don’t forget the worth of heartfelt messages. Send heart touching messages written on Women’s Day to all women who you know. It is the responsibility of men to cheer their partners by sending positive messages as well. No matter what method you choose to celebrate Women’s Day, complete the gesture of celebrating Women’s Day by sending wonderful messages. 143greetings has a plethora of messages written on Women’s Day. You can pick message that relates to your feeling and send it to lovely, pretty women.